The Dutch left has been unable to counter the Islamophobic far right, and it will show in tomorrow's general elections. On March 15, there will be general elections in the Netherlands — and it seems the country will not escape the trend of a rising radical right and the crisis of the center-left. Left-wing political parties as well are having difficulties, and social movements are struggling to find their way. A radicalizing far right with a virulent Islamophobia at its core has succeeded in altering the political and social landscape. It is no use denying that for the Left, the situation is bleak. How did we get here? Once described by Karl Marx as the model capitalist nation of seventeenth-century capitalism, the Netherlands always had a relatively small left and workers’ movement. Geographically small, but located in a commercially strategic position, the Dutch republic enjoyed a head start as a merchant-capitalist country in the seventeenth century. But this head start became a disadvantage with the onset of the Industrial Revolution. Only in the late nineteenth century, during the long expansive wave before World War I, did industrialization begin to take off, and with this the creation of a modern working class. For a long time, this working class was divided along confessional lines. Alongside a Protestant workers’ movement grew in the late nineteenth and early twentieth century a movement of the disadvantaged Catholic minority. The confessional workers’ organizations were part of extensive multi-class milieus that included economic, cultural, social, and political organizations. These currents formed what sociologists have called “pillars,” veritable parallel societies. However, the leaders of these pillars were always in contact with each other, developing a culture of consensus and mutual give-and-take that defused potential conflicts. Dutch socialism was late to develop with the foundation of the Social Democratic Workers’ Party (SDAP) in 1893. This party and its associated unions and networks were quickly integrated into the “pillar system.” In the absence of serious challenges from below, the Dutch bourgeoisie could allow itself the luxury of relatively liberal rule. As industrialization was delayed, the relative importance of Dutch colonial possessions, especially Indonesia, increased. The importance of trade, from the colonies or from the port of Rotterdam to the new industries in Germany, meant many people worked in the service sector, instead of in the kind of large-scale industries that in neighboring countries became bulwarks of the workers’ movement. Before World War II, the social-democratic union organized barely organized half of all trade-union members, while the SDAP could not win a quarter of the vote. After the war the Dutch political system changed drastically. A second wave of industrialization completed the process of industrialization. The churches lost their influence on the generation born after the war. The cultural revolution of the sixties deeply changed Dutch society as the Dutch bourgeoisie proved itself flexible and accommodating. In universities and workplaces, old hierarchies were altered to give students and workers more autonomy. Much of the new leftist ferment was channeled into the social-democratic Labour Party (PvdA, the re-foundation of the SDAP after the war). With some years’ delay, women and gays and lesbians were given increasing rights. The old nationalist mythology of the Netherlands as a country of brave explorers and seamen was replaced by a new one of the country as a liberal “merchant nation” whose involvement in world trade had supposedly made it exceptionally humanitarian, peaceful, and broad-minded. This idea, captured in the saying “Nederland, gidsland” (“the Netherlands, a model country”) ignored its long colonizing past as well as its important role in the slave trade but fused elements of the new liberal hegemony into a new nationalist ideal. One upshot of this effective “repressive tolerance” was that the country never saw anything like the social unrest that occurred in neighboring countries. Neither did the sixties produce a durable radical left. History went a different route as the workers’ movement and the New Left had been successfully integrated. As unemployment approached one million in a total population of fourteen million, instead of a hard fight, the trade-union movement committed itself in 1982 in the Wassenaar Arrangement to a policy of wage moderation and “shared responsibility” for economic growth and profitability. Already in 1982, Den Uyl admitted that the crisis and unemployment were used to “diminish the power of the trade-unions, restore old privileges, increase inequality, and demolish the welfare state.” The same decade, the far left disappeared from parliament. In the nineties, neoliberal policies became hegemonic. The PvdA, after years in opposition, formed in 1994 a government coalition with the traditional party of the Right, the pro-business, secular People’s Party for Freedom and Democracy (VVD). The PvdA converted to Blairite Third Way politics. With the former social democrats as frontrunners, in this decade the labor and housing markets were liberalized, along with important parts of social security, health care, and the pension system; and public companies were split up and privatized. But economic growth rates were higher than they had been since the early seventies. The Wassenaar Arrangement and the voluntary policy of wage moderation, products of the culture of intra-elite negation and pacification that was inherited from the pillar system, were celebrated as uniquely Dutch characteristics that supposedly allowed the country to avoid “needless” and “damaging” conflicts like strikes and other social struggles. Much of this new economic growth was thanks to the financial services sector. Today, over a quarter of Dutch exports are financial services. Although the financial sector creates relatively few jobs, it plays a crucial role in the Dutch economy and Dutch companies play an important role in the international banking and financial sectors. Concomitant with this is the strongly pro–European Union orientation of much of the Dutch bourgeoisie. The country has always been a small but driving force behind European economic integration. If anything, its economic interest in the continued expansion of the European Union has grown rather than diminished. The Netherlands is the second largest exporter in the European Union, and more than 50 percent of its exports and re-exports remain in the European Union. The ardor with which Jeroen Dijsselbloem, finance minister, temporary chair of the Eurogroup, and leading member of the PvdA, devoted himself to destroying the fabric of Greek society to the benefit of the financial sector is a fitting illustration of the Dutch politics that was born in the nineties. Since the turn of the century, this establishment has come under pressure. The first challenge came from the left in the late nineties and early 2000s. The SP (Socialist Party — although the party no longer uses it full name) has its roots in a small Maoist party, the product of the youth radicalization of the sixties. The weakness of the Dutch left opened a window for a small group of Maoist activists to win a foothold among unorganized, mostly Catholic, workers. In the nineties, the SP was able to reinvent itself as a parliamentary social-democratic party while the Communist Party and the far left dissolved themselves in a new Green Party and the PvdA embraced social liberalism. Thanks to the Dutch system of proportional representation, 118,738 votes (1.3 percent) brought the party two seats in 1994. In 1998 the SP won five seats. Around the turn of the century, the party underwent a further ideological shift, dropping its Marxist references, embracing an ethical socialism, and declaring electoral contests to be its focus. In 2002 the party won nine seats and since then it has tried to position itself as a future ruling party and alternative for the PvdA. In the meantime, the other side of the political spectrum also saw the rise of an insurgent current. Pim Fortuyn, a former social democrat who had worked as an academic and public servant, became increasingly well known in the nineties as a right-wing columnist and public speaker. He connected with the new neoliberal common sense by arguing for further liberalization and deep cuts in social services. However, he combined this right-wing economic liberalism with a nationalist populism that decried the loss of community and the erosion of social norms and values. Increasingly, something called “Islamic culture,” supposedly uniform and resistant to historical change, was framed as a threat to Dutch society. Since Fortuyn claimed to be criticizing “culture,” not attacking people for their ethnicity as such, he avoided the taboo on the old biological racism of the extreme right. Another way he set himself apart from the old extreme right, while simultaneously gathering more ammunition for his fight against “Islamic culture,” was his incorporation of elements of the hegemonic liberal ideology. Fortuyn assimilated concepts like the separation of church and state or equal rights for women and homosexuals into the “Dutch culture” that was supposedly under threat. Cultural othering replaced racial othering. The chauvinism of “Nederland, gidsland” proved to be a highly effective weapon and dissociated this new, populist right from the old fascist extreme right. It fed what antiracist thinker Gloria Wekker later called “white innocence” — the ideology that Dutch society simply can not be racist because it is supposedly inherently egalitarian. After entering the political arena in 2001, Pim Fortuyn became very popular. Compared with the bland, technocratic politicians produced by the neoliberal consensus, Fortuyn, a skilled showman, stood out. Whereas other politicians competed with each other in trying to convince people that they were the right candidate to manage the status quo, Fortuyn said he would change the status quo. This enabled him to tap into the support of people who for different reasons felt ignored by the political establishment. Fortuyn was murdered in 2002, and his party fell apart. But he became a kind of prophet figure for a new, nationalist current that in the last decade and a half was incarnated by several parties. The current Dutch far right is the offspring of Fortuyn, and the Freedom Party (PVV) of Geert Wilders is the newest incarnation of this nationalist, populist right. It is also the the most radical one. 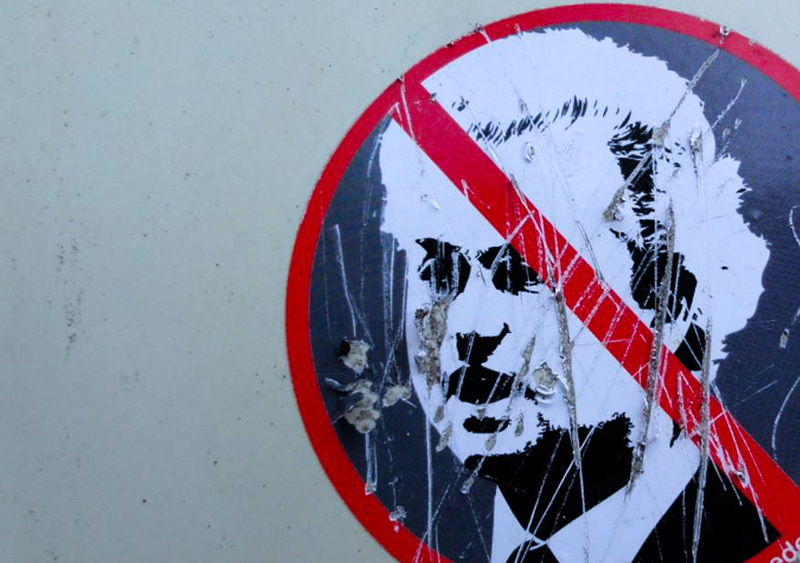 In 2004, Wilders left the VVD and two years later organized his own party, the Freedom Party. As it was for Bolkestein and Fortuyn, hostility towards Muslims was central for the new party. In 2004, the country was shocked by another murder as filmmaker and columnist Theo van Gogh was killed by an Islamic fundamentalist. After the murder, dozens of mosques and scores of people were attacked. Riding this wave in 2006, in the first elections it participated in, the PVV won 9 out of 150 seats in the parliament. Since then, the PVV has developed in two ways. One is that where before it presented a hardline neoliberal economic program, it now presents itself as a defender of the Dutch welfare state. Like other gains such as women’s rights, social services are presented as products of Dutch culture and hence under threat from alien cultures, especially from Islam. In deals the PVV has made with right-wing parties in parliament, it has shown that its welfare chauvinism is secondary to its anti-Islam and anti-immigrant agenda. On these issues, the party has steadily radicalized. Today, PVV positions include making social security dependent on length of citizenship and language skills, denying social security to people wearing a burqa or niqab, banning the Quran, closing the borders for refugees while shuttering all refugee centers, closing all mosques, banning people with a double nationality from fulfilling public positions, banning the Islamic headscarf for public servants, preventive arrests of “radical Muslims,” and completely banning immigration from Islamic countries. For the PVV, its welfare chauvinism and Islamophobia are intimately connected. The welfare state is under pressure, it claims, because of immigration. Dutch Muslims, Islamic migrants, and refugees, who in the PVV’s discourse are all part of the same Islamic menace, are supposedly parasitizing a system build by “the real Dutch” and are allowed to do this by the leftist elite that supposedly controls the country. The PVV presents its racist proposals as means to save the remains of the welfare system. This is partly why PVV support for austerity measures does not automatically lead to a decline in support; austerity after all is supposedly made necessary because of Muslims and can only be stopped by radical, racist measures that would deprive countless Dutch citizens and immigrants from human rights. The current Dutch government is, like in the nineties, a coalition of the PvdA and the VVD. In this coalition, the PvdA is the junior party. On social-economic policies but also issues such as refugees, the right-wing VVD is dominant. The government implemented austerity measures that among other things meant the disappearance of thousands of jobs in the public and health-care sector, cut support for chronically ill people, and abolished student grants. In fact, the government has been so diligent in implementing austerity that even a report of the ING Bank concluded its policies “needlessly” cost hundreds of thousands of jobs. And yet, the PvdA entered this government after it had tacked left in the campaign for the parliamentary elections of 2012 to stave off the threat of growing support for the SP. Current polls spell little good news for the PvdA, predicting a loss of two-thirds of its seats. The VVD looks set to lose seats as well, but less dramatically. Today, other political parties are often reduced to responding to the PVV. The VVD has entered a kind of symbiosis with the PVV, presenting itself as the “reasonable” version of the radical PVV. The undiluted original meanwhile also attracts support, polls predicting that the party could double to about a fifth of the vote — possibly even becoming the largest party in parliament. The SP meanwhile seems to benefit little from the predicted implosion of the PvdA. One reason for this is the large role of the PVV in the public debate. The SP has had most success when it could present its social-economic proposals but the Islamophobic and anti-immigrant noise of the PVV, echoed by the VVD, drowns out discussion of social-economic issues. The SP has never been very interested in antiracist campaigns. It sees racism as a secondary effect, produced by social-economic misery and competition between workers: improve people’s social-economic prospects, and racism will quasi-automatically disappear. To talk about racism is to divert from supposedly real issues. This means the SP’s election program barely mentions racism while the issue is everywhere. Polls show a considerable part of the new PVV voters come from previous SP voters. Its neglect of racism also means the SP it is unable to bring together people who are victimized by it and want to fight it. The coming elections will see the participation of small new parties that, with some success, have made antiracism central to their program. Likewise, the Greens are predicted to win substantially, possibly becoming larger than the SP. The Dutch Greens are traditionally seen as antiracist and there is no doubt many people will vote for them because they want to oppose the PVV. The SP’s orientation to government participation is another dilemma. So far, the PvdA has staved off the threat of the SP by successfully tarrying the party as inexperienced and unrealistic, and hence unable to deliver real benefits to people. The SP responded to this by moderating its demands, accepting for example the raising of the retirement age from sixty-five to sixty-seven and the European Stability Mechanism. To prove its capacities as a governing party, the SP joined several executives, such as in the capital Amsterdam, where it has formed a coalition with right-wing parties. But this approach has also meant the party is seen less as the party of the opposition, and as too tame for many. The SP tried to overcome this with offensive demands like the increase of minimum wages, taking up again the demand of retirement at sixty-five, increasing pensions, and lowering rents. The party has gone into the election campaign with the slogan “take the power” — but in polls it barely comes above the the 10 percent it gained in 2012, or is even predicted to decline. The SP is struggling with a contradiction: is it the party of social protest — or a government party in waiting, an “improved” version of the PvdA? Electorally, the second prospect just doesn’t seem to be in reach — unlike in 2006 when the party won twenty-six seats. But neither can the party position itself as the leader of social dissatisfaction as it neglects one of the core issues: racism. But the problems of the Dutch left are more fundamental than the approach of the SP. Simply put, the country sees high levels of anger and dissatisfaction that are captured by the populist right while social mobilizations are at a very low level. Social movements are extremely weak. One domain that has seen some dynamism is antiracism which has attracted new activists, often young people of color. But this is still far from being a mass movement. The main trade-union federation, the FNV, in the meantime is going through difficult changes. Since the eighties, unionization has dropped from 35 percent to less than than 20 percent. Even more worrying is the deterioration of the union structures. There is a lack of activists and often of elementary know-how. In the words of one trade-unionist, decades of voluntary wage moderation meant that the FNV went from a situation in which it did not want to fight, to one in which it no longer knows how to fight. When a few years ago the FNV, for the first time in decades, again decided to organize a May Day event, the organization was contracted out to an event agency that put blackened fences around the terrain so passers-by could hardly see what was going on. In recent years however some progress has been made. The structure of the federation was reformed to make it more democratic and activists are trying to orient the unions to a more activist approach, one that can also appeal to younger and more precarious workers than the traditional base of older, white, male workers. But this is still a slow and difficult process. The difficult but real changes in the unions and the beginnings of new antiracist initiatives and structures point to possible ramparts against the current right-wing drift of the country. Although far from as radical as it is sometimes presented, both by right-wing opponents who want to denounce it as unrealistic and by international anticapitalists looking for success stories, the continued support for a party like the SP shows that many people want to see a different Netherlands. Bringing these points of hope, sometimes composed of very different people, together will be a difficult and long-term project. But it is the only way forward. Republished from International Viewpoint . Alex de Jong is editor of the socialist journal Grenzeloos and an activist in the Netherlands. The Dutch left has been unable to counter the Islamophobic far right, and it will show in tomorrow’s general elections.